Latin American leaders have ended the second summit of the South American Community of Nations with a call for greater regional integration. The summit was held in Bolivia alongside a meeting of indigenous groups from around the continent. But it took place amidst tensions as Bolivian opposition groups are seeking greater autonomy for some areas. Campaign leaders have called on hundreds of thousands of their supporters to rally next week. A band warmed up the crowd for the arrival of the visiting presidents. It felt more like a music festival than a meeting of heads of state. The Venezuelan President Hugo Chavez, the Bolivian President Evo Morales and the Nicaraguan President-elect Daniel Ortega addressed a crowd of 40,000 in Cochabamba's main stadium. Social and indigenous groups from around the continent were invited to the event, which ran in parallel with the summit. The call was for an end to free trade. But in their official meetings the presidents produced few concrete results. A South American parliament was mooted. A secretariat is to be set up in Brazil. Its aim will be to create a political bloc similar to the European Union. But the main progress was in arranging further talks. Yet while South American leaders spoke of unity, Bolivia itself is increasingly divided. In the eastern city of Santa Cruz, thousands marched on Saturday in favour of regional autonomy and a greater say in the writing of a new constitution for Bolivia. 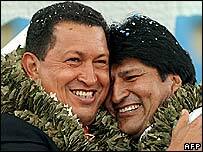 Speaking at the Cochabamba summit, President Chavez accused the pro-autonomy movement of being allied to what he called US imperialists. He said Venezuela stood ready to help Bolivia in any way. For their part, the Bolivian campaign leaders have called on hundreds of thousands of their supporters to rally next week to add to the pressure on Mr Morales' government.